Whether you’re traveling for work or taking the kids to the park, you can manage your security system, thermostat, lights, and small appliances all from your smart phone or computer. 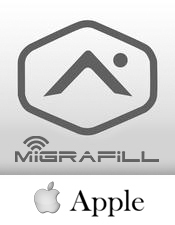 Access your online account powered by Migrafill Electronic Security by coming to this page and entering your login and password. If this is the first time you are logging into your account, use your provided login and temporary password and complete the email verification process. Once logged in, you can easily change your password under the Profile tab > Login Info menu. Click on one of the icons in the Arming panel to Disarm, Arm (Stay), or Arm (Away). View recent arming/disarming and system events. Click anywhere on the Features Usage bar to track your progress with key features setup. Click on the arrow to easily jump to the pages to setup User Management, Notifications, emPower*, Image Sensor*, Video*, and Mobile features. Go to Security > User Codes. 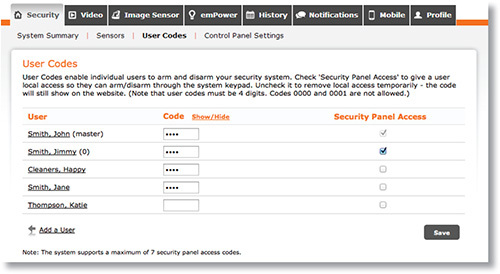 Enter a code for each user who should be able to arm/disarm your security panel. Go to Profile > Manage Logins. Click Add a Login to add website users to your account. 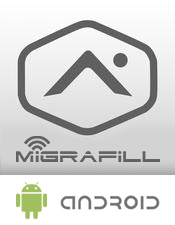 These users can also login via the Migrafill mobile apps and mobile site. Go toProfile > Mobile Access for more information. 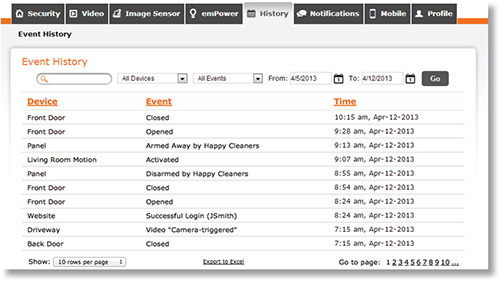 Click on New Notification > Standard to setup the essential security event and sensor activity notifications. Click on Standard > Alarm to configure notification rules and to identify which contacts should be notified in the event of an alarm. 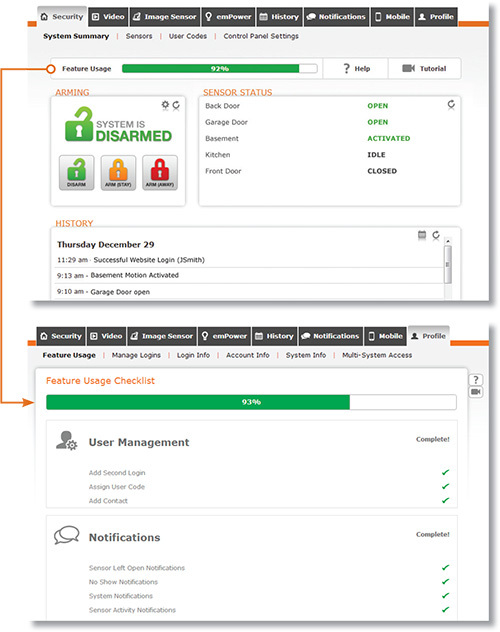 Arming Event: Identify the contacts that should be notified when specific users arms or disarm the system. Arming Reminder: Setup an arming reminder that lets selected recipients know if the system is not armed by an expected time. 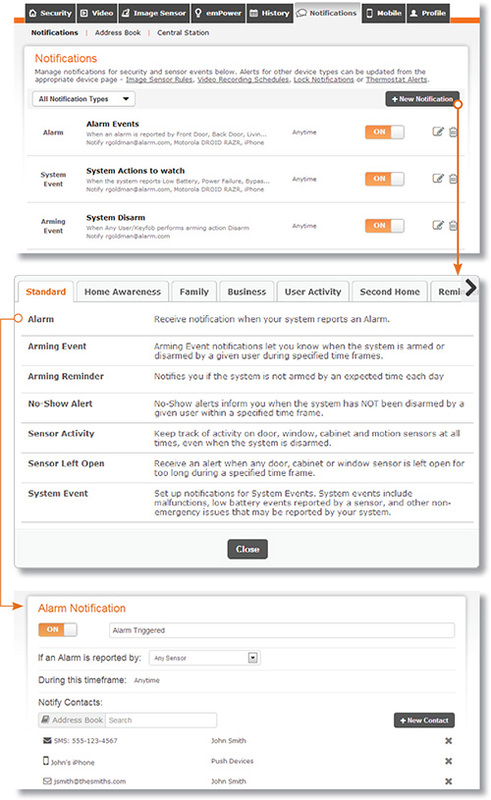 No-Show Alerts: Setup an alert if a certain person did not disarm your security system during a specific time period. Sensor Activity*: Receive alerts when doors or windows are opened or closed. Sensor Left-Open: Find out when doors or windows have been left open for a specific time period. System Event : Setup an alert for non-alarm systems events, such as power failure or a low battery. 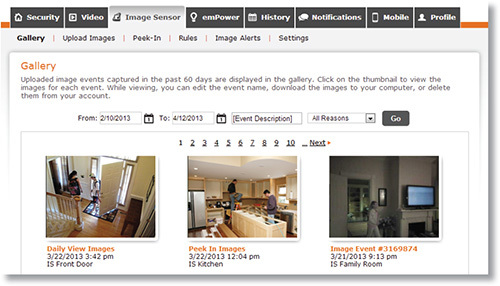 Go to Image Sensor > Gallery to view all Image Sensor images uploaded within the past 60 days. Click on each image thumbnail for a larger view. To enable Auto Zoom click on the Settings tab. Go to Image Sensor > Upload Images to upload images captured by the Image Sensor. Note that Daily View, Peek-In and images captured on alarm are automatically uploaded. Click the Upload icon to upload an image, and the View icon to view images already uploaded. Use the menus to filter by device, event type, and date range.